Obviously markets have been in substantial flux, not only this week but over the past few months as European leaders’ plan(s) continue to underwhelm. One thought is just how risky are some of these European peripherial countries’ debt? The idea for the following graph actually stems partially from a recent presentation (PDF slides) by Glenn Rudebusch, the Director of Research and Executive Vice President of the Federal Reserve Bank of San Francisco, in Portland at the Oregon Economic Forum. The topic of sovereign debt risk/default has been widely discussed for nearly two years now. Our office uses one of the nation’s large macroeconomic vendors and combing through their archives reveals the fact that in February 2010 (21 months ago) the company was actively discussing Greek debt and EU/IMF bailout packages and warning about other European countries as well. Fast forward to January 2011 (10 months ago) and their forecast was already calling for a default or restructuring of Greek debt as inevitable. Throw in the fact that the interest rate on Greece’s 10 year bonds rose to twice that of Germany’s back in February 2010 (6.5 percent vs 3.2 percent) and has only climbed since, and the picture that markets have not priced in some sort of default or restructuring becomes awfully hard to paint. While it is likely that such an event is already priced into the bonds, the pertinent questions then turn to the size and magnitude of such an event and any subsequent contagion effects. Note that the graph illustrates the ratio of different bonds’ yield relative to U.S. treasuries (all 10 yr bonds, data from Bloomberg). Even though France’s yields have risen somewhat in recent months, markets continue to view them roughly the same as other major economies and safe havens such as the U.S., Japan, Germany and the U.K. Spain and Italy’s debt is trading at approximately 3 times what the U.S.’ is while U.S. corporate high yield (aka junk bonds) is trading at 4x. 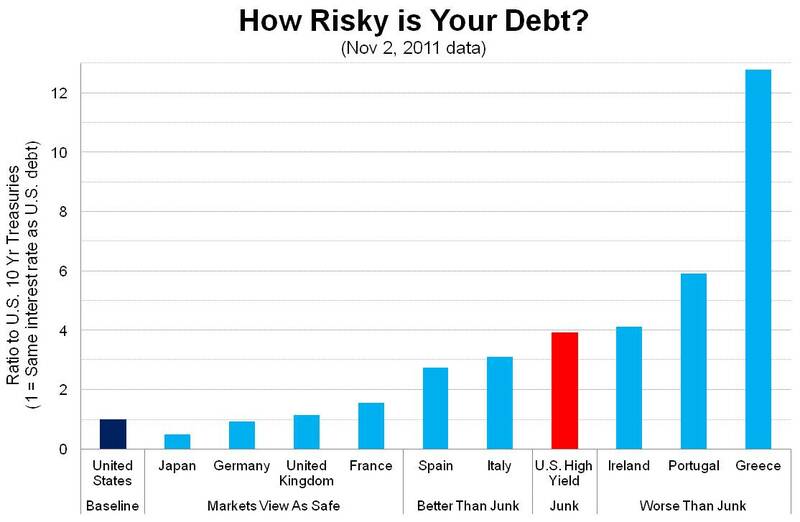 Another way of saying this is Spain and Italy’s debt is viewed by markets as slightly better than junk. Ireland is likewise trading at 4x the U.S. while Portugal is nearly 6x and Greece is over 12x.